Stay Connected with Your Favorite Player's Club App! 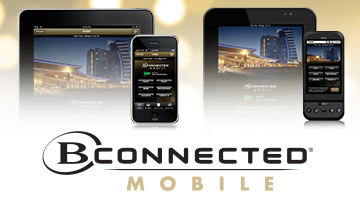 The B Connected Mobile app connects you to exhilarating casino action, fabulous dining, non-stop, live entertainment and comfortable hotel amenities at 17 of Boyd Gaming's exciting locations in Las Vegas, Indiana, Illinois, Louisiana and Mississippi. This personalized app delivers customized news and offers directly to your Android phone, Android tablet, iPhone, iPad, or iPod Touch. Stay connected with what’s happening at each casino with real-time entertainment schedules, gaming and dining opportunities, special offers, and more. For B Connected members, the experience is even greater. Log in to receive exclusive offers, view up-to-the-minute point balances, and receive personalized messages instantly. Make immediate hotel or restaurant reservations either through the app or by making a Quick Call. Connecting with your favorite Boyd Gaming casinos has never been easier! B Connected. Anytime. Anywhere. Available for all Android phones, Android tablets, iPads, iPhones and iPod Touch devices.